A couple of months ago, I spent a few hours at the Dragonmeet convention in London. Unfortunately due to the fact I’d only flown in from New York a couple of hours prior, and I had other commitments during the day, I didn’t have time (or brainpower) to game, but I did have a nice browse. I came away from the Pelgrane Press stand with a copy of the 13th Age RPG by Rob Heinso and Jonathan Tweet. I’d read a bit about this game on various blogs, but I knew very little about it, other than the authors’ reputations! Since then, I’ve read and re-read the rule-book several times, and I’m seriously inspired. I haven’t played a session yet, but it’s definitely coming. It’s no secret on this blog that I haven’t really got the DnD Next bug, despite several attempts to get some play-test adventures going; maybe subconsciously I was waiting to discover this game 🙂 So what’s so much to like? Icons – powerful and mysterious NPCs that form the ‘behind the scenes’ protagonists that drive campaign stories. Characters have ‘relationships’ with various Icons, and there are mechanics to bring this into your gaming sessions. I’ve no idea how this will work in practice, having never played a game like this, but it’s a concept I’m excited about. In the book, the 13 Icons are plugged into the default setting, but they’re generic enough conceptually to see how they might be used in other fantasy milieu. Now this is just superb. 13th Age has no skill system, it just has backgrounds. When creating your character, you simply assign 8 points (or more depending on class) to free-form backgrounds e.g. Imperial Legionnaire +3. It’s then up to the player to convince the GM in any skill-type check that their background warrants a bonus to a standard ability check (as determined by the GM). When I think of the agonising in-again out-again skill systems of the DnD Next play-test, this is so refreshing. It gives players a reason to invest in knowledge of the campaign world and it gives GMs an incentive to create cool organisations and cultures that make sense to the world and story. As a setting designer (i.e. I enjoy creating my world every bit as much as running adventures in it) I can add all sorts of flavour which can be used to mechanically impact games without having to create any special rules. In short, I love it! When coupled with the ‘one unique thing’ concept, which asks every player to come up with a special idea about their character, you have an excellent recipe for exciting and relevant campaign stories. There are currently nine classes in the game, with more coming in the 13 True Ways expansion. The standard fantasy staples are well covered, and they all have the classic feel, with some twists of course. What I really like is that each class oozes with options, but they all have a distinct style of play. The authors make it quite clear that they expect some players to like certain classes better than others, and give guidelines on how they expect a class to play. Better yet, in this world where d20 games seem to suffer from a glut of player options, each class, whilst still having a reasonable amount of choices for customisation, essentially comes as a package. The expectation is that players will achieve variety via role-playing and story options as much as pure mechanics. Also, there is clearly an expectation that different options can be achievable by creating wholly new classes, hopefully avoiding the “X must be a sub-class of Y” arguments that seem to afflict other games. 13 True Ways is expected to introduce some multi-classing options, so that will be interesting to see. In any case, these is no shortage of cool mechanics here; for example the fighter has all kinds of ‘manoeuvres’ that trigger based on the number rolled for an attack. These give some sort of extra advantage, as well as making your actions unpredictable – and therefore ripe for vivid description! The rogue, by contrast, tracks a concept called momentum, which triggers the use of different powers and abilities. Overall, the classes are exciting and fresh takes on classic concepts, and most players should find something that suits their needs! The less a GM has to track in a combat the better, and this definitely seems to be the theme with 13th Age monsters. Only a small number of key stats are used, and the bulk of attacks do fixed damage. Rather than forcing the GM to track encounter/one-use/rechargeable powers, most special attacks trigger directly off certain dice rolls. This had the added benefit of making monsters more unpredictable. Simple but exciting! The core book has more than monsters to get started with adventuring, but there an entire bestiary coming out soon to fill in any gaps. The book comes complete with a default setting, the Dragon Empire, with a chapter devoted to an overview of the world and it’s key locations, many of which are important to the Icons of the game. However, interesting and original as this setting might be (and there are plenty of cool ideas here), I am primarily playing in my own world, Tolrendor, so any RPG rules need to be able to function in this setting. 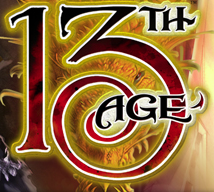 If there’s a complication to 13th Age at all, this is probably it. For the RPG to function, it really needs the Icons to be established, otherwise it loses of lot of its feel. So if you want to play in a different setting to the default, there is definitely some up-front work to be done before you’re ready to go. This will include some modification of class features as well, as some of these are plugged into the default Icons. This entry was posted in 13th Age. Bookmark the permalink. 2 Responses to 13th Age: Inspiration! !